- Tangled Threads -: I'm back! It's been a month since I last posted, well disappeared really, and what a month it has been. The reason everything went quiet on the blog was that my Dad suddenly passed away. As many of you know, we live not only in different countries, but different continents, so things were a bit crazy to say the least for getting back to Scotland. It was a very sad and emotional trip back home. I did take my stitching with me but didn't really have much time to stitch and on the evenings when we did have some free time, I didn't feel like doing anything. But this next part will surprise you.....not only have I completed the stitching (this is where you want to make sure you are sitting down)....I have completely finished, finished it....yes stitched, sewn, stuffed and all the little paraphernalia attached....yay me! Ribbons, bows and bunting all sewn on - isn't it cute? This one didn't even make it to the pile of shame.....just straight off to the sewing machine and all done and dusted in a day....good job you were sitting down, wasn't it?!! Even though I didn't get much stitching done while I was back in Scotland, it's amazing how comforting the hobby of cross stitching can be, don't you agree? 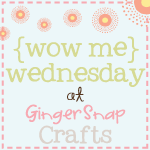 So things are back to normal (well Blog wise anyway) so check back on Friday to find out this week's Fun Finds! I'm so sorry to hear about your father. Beautiful finish! Love the finished look of it. Love the progress on your seashell design. Every time you post this one makes me fall in love with it more and more. Rhona, I am so sorry to hear of the passing of your dear Dad. I know what a great loss that is. Dad's are so special to us. And being so far away definitely made the whole thing harder. Yes I totally agree with you that stitching has a way of calming us and bringing us a safe feeling even when we are not at our best. 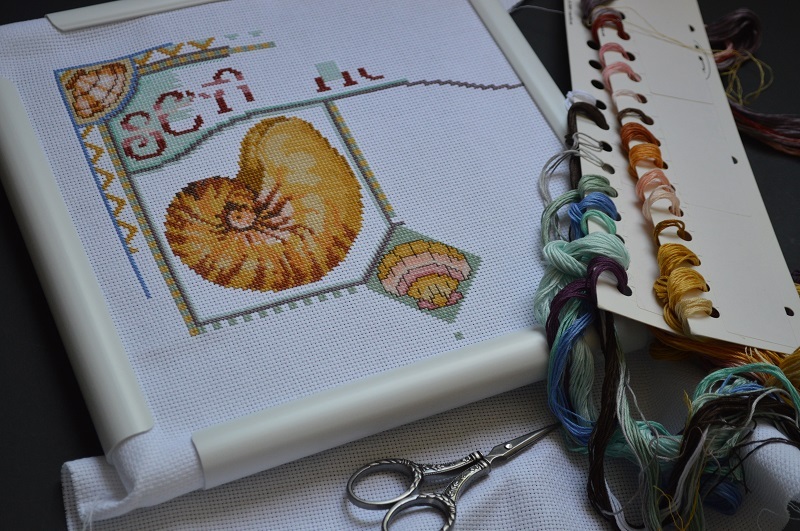 Wonderful little finish and progress on your seashell. I an so sorry to hear about your father , I know when I lost my loved ones my cross stitch , always helped me to take my mind off things . It is such a healer for me. Love your new stitch I have this one two but it will have to wait to be stitched I just have to much to do. Have a good week hugs. So sorry that you travelled for such a sad reason Rhona...sending my condolences on the loss of your father. So sorry about your father...I'm sure that, between the loss the and journey, you've had an extremely rough month. I’m so sorry to read that you travelled to Scotland for such a sad reason. Please accept my condolences on the loss of your dad. I love your seagull sachet, it worked up very well ..... 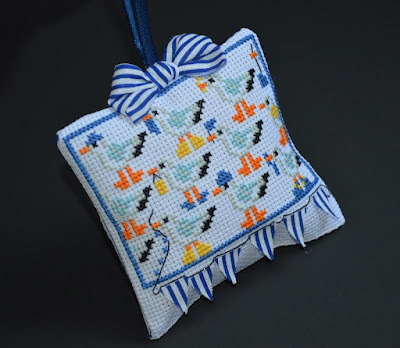 I aim to stitch that soonish (maybe), it would be just right in my bathroom to stop my cupboard doors banging against the tiles! Once I finish “the beach hut”, from the same magazine, I can make a start! ”The beach hut” is taking longer than the 6 hours the magazine suggested too ..... a lot longer! I'm so sorry to hear about your loss. You have managed a lot of stitching in this time - and you are right, it can be a real comfort. Well done on the finish, it looks fabulous. I am so sorry for your loss. AriadnefromGreece! So sorry for your loss!! Hugs and prayers! Sorry to hear about your father. Sending hugs to you. Your finish is very beautiful and you managed lots of progress on your seashell project. Rhona, I am so sorry to hear of your Fathers passing. My condolences to you and your family. 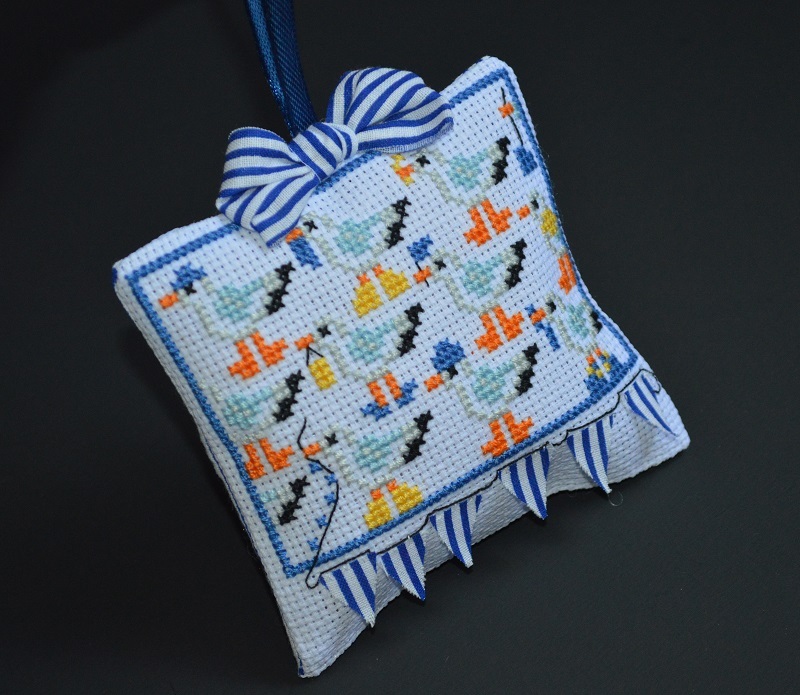 Stitching has a way of taking our mind off our worries and your latest stitch and finish is adorable. I love the bunting you added. So sorry about to read about the passing of your dad. I hope stiching brought you some comfort. Both projects are looking good. So sorry to read that your dad has passed Rhona. Thinking of you and your family. 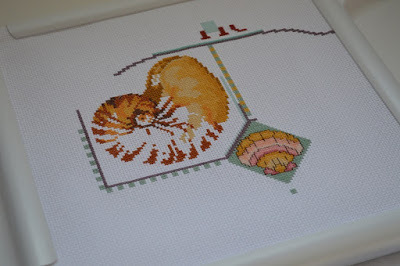 I always find the stitching time estimates in Cross Stitcher to be way off the mark! I don't think I'm a particularly slow stitcher but I can always add on a few hours even to a small project. This is such a lovely finish and well done for finishing it into an ornament straight away! Fun Finds Friday.....a tiny one!